Driftwood Prices DISCOUNTS apply if spending R200 or more! – see further below – PLEASE NOTE that these discounts apply to only our driftwood pieces, and not also to our driftwood products, or to postage and packaging. Our medium (20 to 30cm) and large (30 to 45cm) driftwood pieces are the pieces we usually have the most stock of. Please note that these prices above are for our “standard” driftwood pieces (fairly ordinary pieces / fairly straight pieces / nothing overly-exceptional / not very thick) but we do also sometimes have pieces that are a little more special (but usually not more than 80cm in length) for sale at various prices – usually for sale for about R15 to R200 for each piece, depending on things like peculiarity, quality, strength, thickness, size, etc. Postage and Packaging Price – AT LEAST R99 for Postnet to Postnet (from East London in South Africa to another Postnet in South Africa) and AT LEAST R30 for packaging, and is only quoted once you have placed your order when we have a better idea of the size and weight of the parcel. 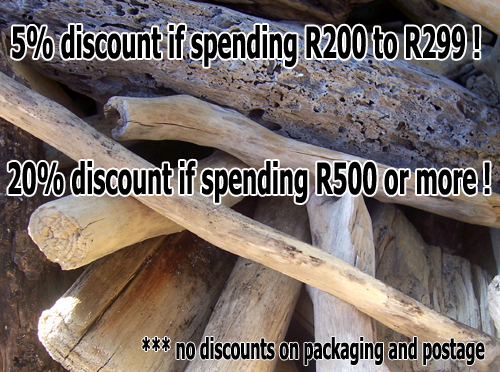 DRIFTWOOD PRICES DISCOUNTS apply if spending R200 or more! *** No discounts on packaging and posting, or on our products prices, sorry. *** ORDER our coastal driftwood pieces at your own risk. No refunds are given. Also see our disclaimer and WARNINGS ! pages, and our how to order page. *** Prices are subject to change, and we will try to update this page as soon as they have. *** Prices on the pages showing our driftwood pieces already sold may be older prices. Do not expect to order something very similar and get charged exactly the same price. These prices (on our pages of pieces already sold) are also before any discounts may have been applicable (the person ordering may have paid less (than is shown) for specific lots depending on how much money they spent in total – see applicable discounts above).